Thank you for choosing Valley Ag Canvas, ?where you’ll find the highest quality workmanship at the lowest possible prices for your commercial needs. We've been in business since 1984 and we’re proud of our contribution to feeding the nation from the Salinas Valley. All our tarps are made here in the U.S. using domestic and foreign materials. We've heard your cry and have purchased a large supply of mesh that meets this need. Introducing our 95% Polyethylene Mesh which we call RHINO MESH. It's a knitted single filament netting that is 2 times stronger than any Poly Mesh material on the market. We're the first and only ones to have this dense of material and we're manufacturing it just for this purpose. This 12.9 oz sq/yd material is so tightly wound that it will keep any insects from escaping your citrus load and is legal with holes much less than the minimum limit of .3 square millimeters. This Black mesh is available now. Call now for pricing and to discuss your needs. "Tarps or mesh coverings must not have holes larger than 0.3 square millimeters (0.547mm x 0.547 mm or 0.6mm x 0.5mm), which is the standard tarping requirement per the USDA." Be sure to ask for RHINO Mesh!!! “Shade” means blockage of direct sunlight. One indicator that blockage is sufficient is when objects do not cast a shadow in the area of blocked sunlight. Shade is not adequate when the heat in the area of shade defeats the purpose of shade, which is to allow the body to cool. 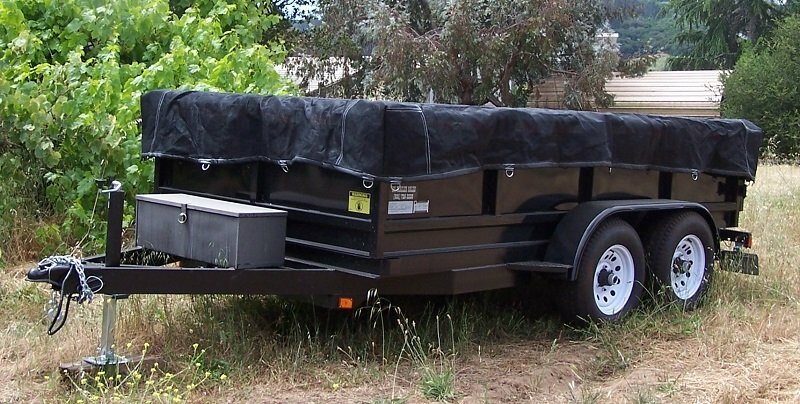 We carry vinyl tarps which give your workers a 100% shade factor. Don't forget to order tarps with light colors. Many customers want tarps with their company colors, but dark colors such as black, blue, green, brown and burgundy can add up to 30 degrees of heat. It looks nice but is bad for the workers trying to cool down. Every one of our tarps is custom made right here in the United States and they come in a host of colors, materials and mesh sizes. The harvesters in Salinas California use our PVC coated tarps to provide 100% shade for the workers. Here's a quick video of the kind of work we do. Our skilled craftsmen also make custom tarps for a variety of equipment along with various projects for produce cooler applications. For truck and trailers that don't need waterproof covers, the knitted fabrics are most often used. The lightweight, inexpensive, breathable material, allows the wind to blow through the fabric reducing flapping and tearing that destroys your tarps. The edges of the tarps are reinforced making our tarps extremely strong. We have found, for tie down purposes, that seat belt loops out last grommets 4:1, and we install these as standard with no extra cost. The knitted material will not tear or run when you accidentally poke a hole in it. After folding the edge of the mesh over twice, we wrap the hem with webbing, fold the seatbelt material and sew it in place. Typically we sew loops every 2 or 3 feet but you can have as many or few loops as you need. These tie down loops are extremely durable. We can also install a D ring in the loop. Introducing our 95% Polyethylene Mesh. This is a black UV stabilized net perfect for your shade needs. It will block 92 - 95% of the sun and wind. It is stronger than anything like it on the market today. Made from your choice of 18oz or 22oz vinyl, these tuff covers protect your equipment from wet environments like this control panel shown in a local cooler. With zippers in the corners the cover fits around frames and provides easy access when needed. We also put in windows for viewing control lights and screens and windows with velcro when you need quick access to buttons and switches. Our experts will come to your location (Monterey County) to measure and design these covers. More info coming. Call 831.758.1234 to discuss your needs. OUR 4' FENCE WILL BE TEMPERARILY UNAVAILABLE DUE TO CHANGE OF OWNERSHIP. SORRY FOR THE TROUBLE. Try our agricultural and barrier fencing. This windscreen is a 4' tall knitted polyethylene mesh that is unique and specifically made for us. It's designed to let about 30% of the wind through, preventing the material from destroying itself in a few short years. You will not find a longer lasting fence material anywhere else. Rolls are 100 yards (300 ft) long.Use it around waterways to discourage wild boar, coyote and other varmints from entering. This reduces E-coli and Listeria bacterium in your food. Valley Ag Canvas expertly repairs bee nets. Our knowledgeable staff knows how important it is for you to keep every insect in its place, so we go over the nets with a "fine tooth comb" to make sure your nets are ready to go back into service. We also reupholster truck, tractor, and other field equipment seats. Protect crops from the oil and grease coming from your tractor's. We fabricate these small tarps with different sizes, thicknesses, and colors. Copyright Valley Ag Canvas. All Rights Reserved. Online Store powered by 3DCart.